Ready to Unlock America’s Potential? Join our team of talented and motivated individuals! We are always looking for more qualified staff and interns to help us keep up with the need for our program in developing communities. Listed below you will find current opportunities. Please email your resume and cover letter to the contact specified on each posting. See our Contact Information for questions and comments. There are no openings at this time. Please check out our many ways to get involved through volunteering! 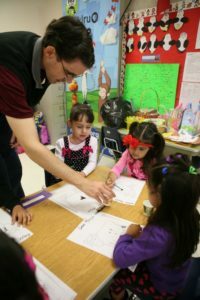 Family Studies Graduate student Jorge Cox works in the child development classroom during his internship at AVANCE. marketing, graphic design or writing and research, an internship at AVANCE is both rewarding and provides critical real world work experience that will translate into a variety of fields. In the past, interns have conducted statistical research and analysis, worked with children in our early learning center, assisted with donor relations, developed outreach material, and organized special events. We love our interns! It is really exciting to be working alongside professionals who are helping families and children to become more successful at school and for the future. I see how at AVANCE we are applying all the theories that I learned in school. Internships are unpaid but can count as college credit. If you have other interests or skills which you believe can be carried out through AVANCE’s work, we are always open to new ideas to enhance capacity and strengthen the agency.